I was looking for something to create few flowcharts. I do have Visio at work, but I don’t mix well with MS Office. Almost instantly (Portableapps read my mind) I got Dia, described by developers as Visio-inspired diagram software for casual use. Dia allows to quickly and easily create various diagrams. Approach is unified for different sets of symbols (from classic flowcharts to Cisco and cybernetics) and you can use any elements in same document. My expectation was to get mess of an options and some learning curve, but Dia is quite opposite. Interface is streamlined. Large sidebar part practically holds all of it – tools and library of elements. can be extended with additional sets (XML+SVG) and Python plugins. While some office-related software (like OpenOffice) aims to be full replacement for Microsoft suite, Dia is more of home use alternative. It primarily uses own formats for diagrams (there are export options on other hand) and for sets. It is good by itself but isn’t (and doesn’t aim to as of now) drop-in replacement for Visio. Easy to use software for diagrams, that is open source, cross-platform and natively portable. This looks pretty cool. I picked up EDraw Max at GOATD, but lost it on my laptop in a restore a while back. It will be nice to have something I can carry on my flash drive to replace it when I’m not at home. Yeah, I was quite pleased to find this one. :) Don’t need flowcharts that often so relatively compact and portable solution is great. 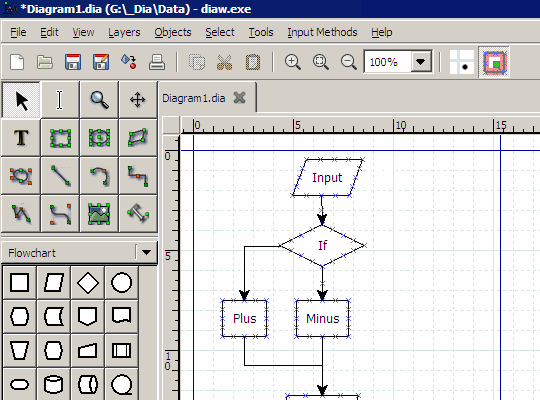 Great freeware application for lite diagramming. I agree that Dia is a nice application but not really set to be a full replacement for Visio. At my work, we’re testing an online application that purports to be a true Visio replacement called LucidChart. Overall very sleek and quite robust. The Visio import feature is nice though they’re still working on the export. No experience with that one, but I think that open source desktop application and online paid (free account seems useless) service are two very different beast to compare. This wizard will guide you through the installation of Dia 0.97.1. Excuse me? If it’s NATIVELY PORTABLE then it should NOT be messing around with any system files! You sure you downloaded portable installer? It’s packaged by PortableApps and is separate from generic one. There is also zip package without installer at all. who developed the DIA??? plss Answer I need it tnks!